NEW BRUNSWICK, New Jersey -- Former Vice President Joe Biden, speaking to students at Rutgers University on Thursday, defended college sexual assault guidelines he helped champion that recently were relaxed by the Trump administration. During a 45-minute speech to about 2,000 students on combating sexual violence, Biden also took shots at disgraced film executive Harvey Weinstein over recent sexual assault revelations and at President Donald Trump. Last month, the Trump administration replaced Obama-era guidance on investigating campus sexual assault that allows universities to require higher standards of evidence. The original guidance, released in 2011 and updated in 2014, instructed universities to use a "preponderance of the evidence" standard when assessing and investigating a claim of sexual assault. Education Secretary Betsy DeVos' new interim guidelines let colleges choose between that standard and a "clear and convincing evidence" standard, which is harder to meet. Biden, a Democrat who was behind domestic violence legislation as a senator in the 1990s, said DeVos considers the old guidelines "unfair to men." He said she and others are trying to confuse the issue. "It's a civil proceeding," he said. "To say 'You were engaged in this behavior and the preponderance of evidence demonstrates it, and that's why you are being penalized in the following way.' They make it sound like what it's not - putting the violator in jail. Don't let them confuse you." Biden called Weinstein's conduct "disgusting" and "immoral" and said, "It is my hope there are more consequences, that the statute hasn't run out. This man deserves more than to lose his company." Rutgers said this week it won't return a $100,000 donation from Weinstein that's being used to help fund the Gloria Steinem Chair in Media, Culture, and Feminist Studies. 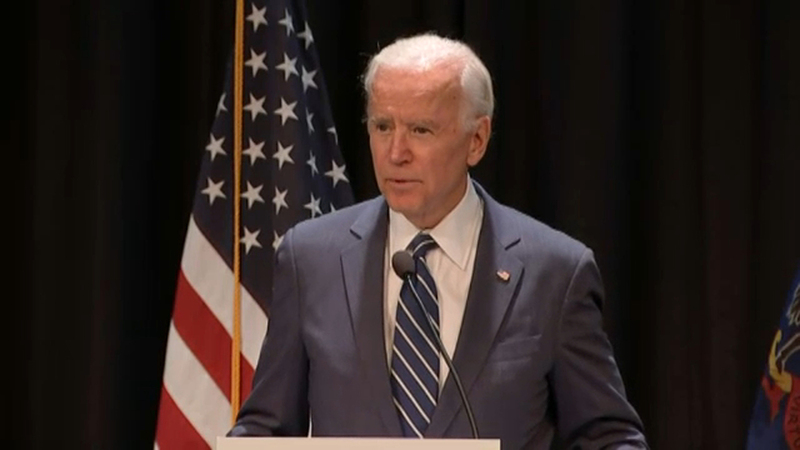 After several students recalled their own personal experiences of sexual assault, Biden praised Rutgers for its efforts in support of victims of sexual assault and dating violence. On Trump, Biden said, "I know our president talks about locker room talk," referring to the Republican president's explanation for derogatory comments he made about women during last year's campaign. "They didn't talk that way in my locker room," Biden said and noted, "usually the guy who starts that conversation is the ugliest SOB in the room." Biden, who had campaigned for the Democrat running for governor in New Jersey before the speech, spent nearly an hour shaking hands and taking selfies with students, who greeted him with thunderous cheers when he first took the stage.